As you may know, I’ve gone wild blueberry crazy this week (not much different than most weeks). But they are just so delicious and packed with nutrients. 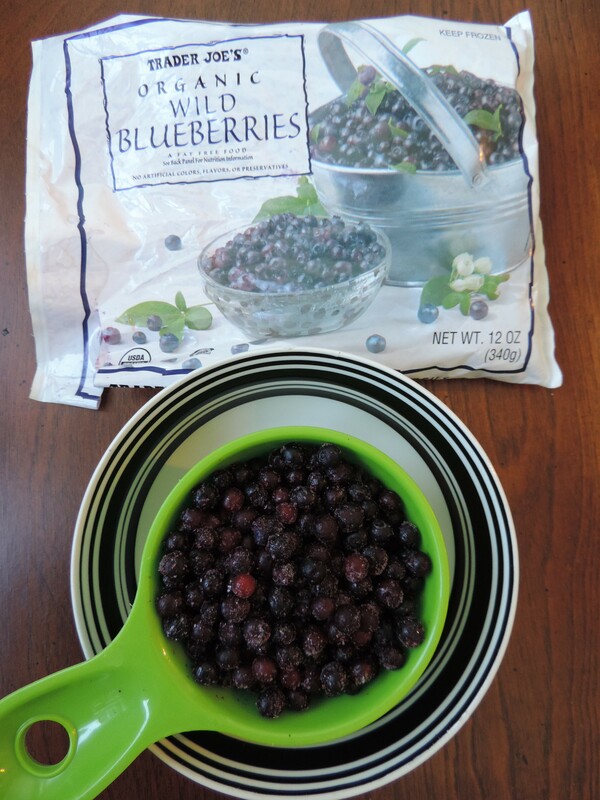 Do you know the difference between wild blueberries and regular, cultivated berries? First off, wild blueberries have never been modified or messed with, meaning they are the same berry that existed 10,000 years ago. Which is pretty awesome. Besides that, they have a more intense flavor and color, are smaller and thus you get more berries per pound and they have a higher concentration of beneficial phytochemicals — twice the antioxidants as compared to regular blueberries! Which means major health benefits (see laundry list below). Frozen Fresh Wild Blueberries offer consumers the most convenient way to have the Antioxidant Superfruit at hand at all times. Frozen Wild Blueberries are an excellent value, they offer consistent quality, ease of use, high antioxidant content, health benefits, less spoilage, affordability. Learn more about the benefits of wild blueberries here. And with that, let’s talk recipes. Healthy food is only good for you if you actually eat it, and while wild blueberries are delicious on their own, they also lend themselves well to both sweet and savory applications. 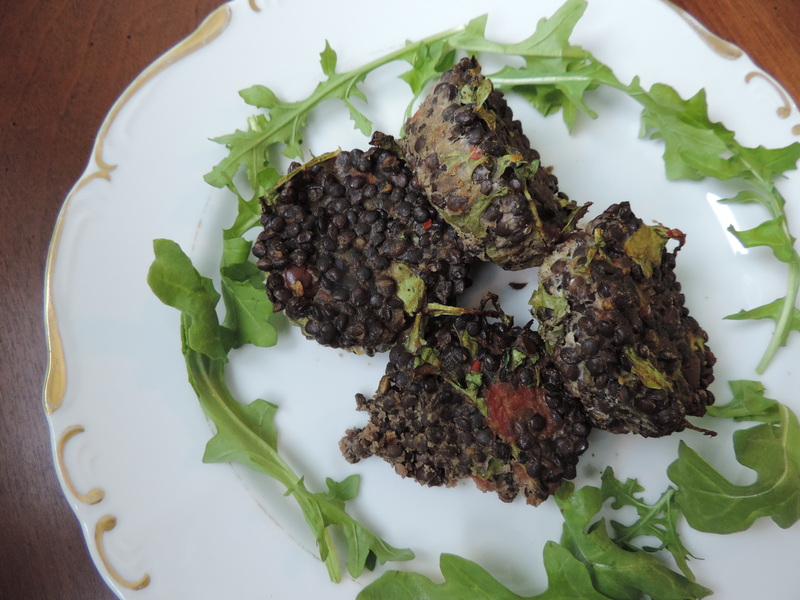 Check out my recipes for Wild Blueberry Truffles and Wild Blueberry, Avocado and Corn Salsa for more inspiration. And if you are looking for more ways to use wild blueberries (clearly you should), they pair well with honey, mint, cilantro, basil and lemon, to name a few. Farro is one of the oldest cultivated grains — enjoyed for roughly 5,000 years. It has a texture similar to barley with a nice, nutty taste. 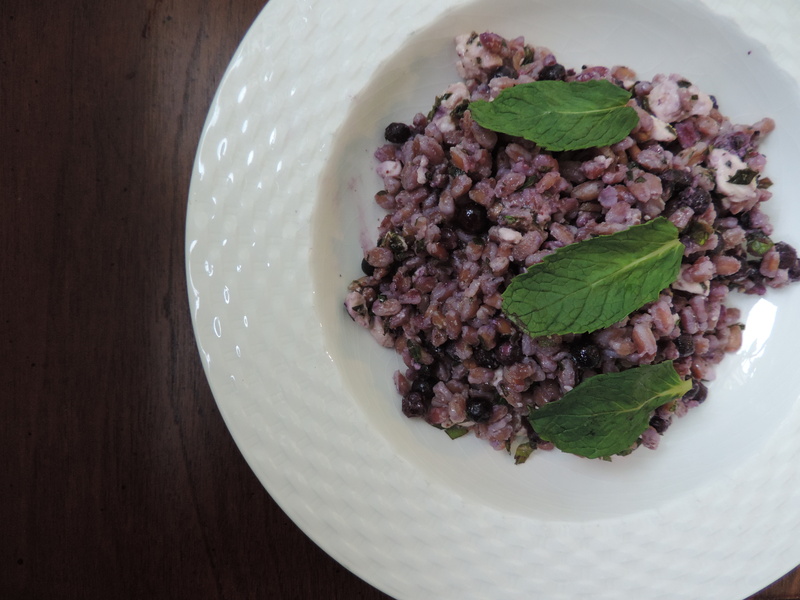 Like wild blueberries, farro is delicious in sweet and savory applications. Plus, it’s packed with fiber, protein and a wealth of other nutrients. 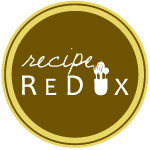 *By posting this recipe I am entering a recipe contest sponsored by the Wild Blueberry Association of North America and am eligible to win prizes associated with the contest. I was not compensated for my time. Prepare farro according to package directions (generally requires about 25-35 minutes of cooking). 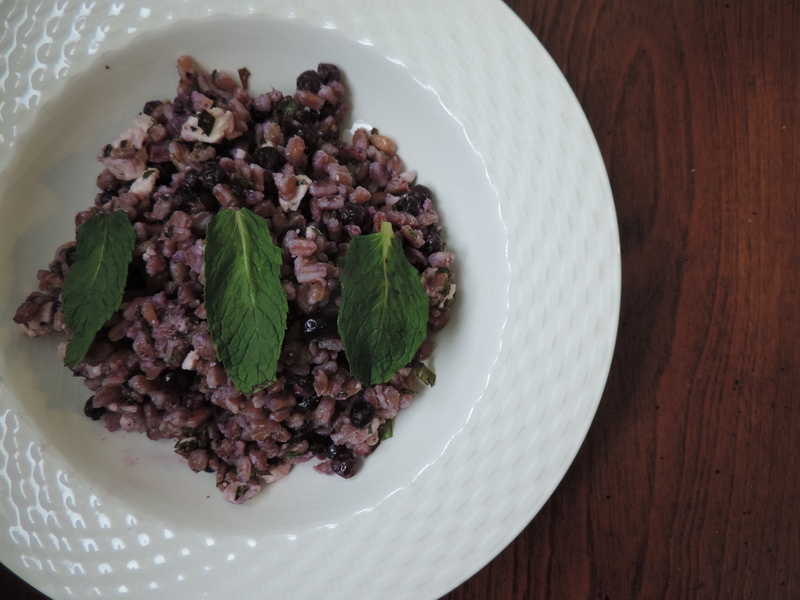 Gently mix prepared farro with remaining ingredients, being careful not to smash the wild blueberries. This salad is delicious hot or cold. 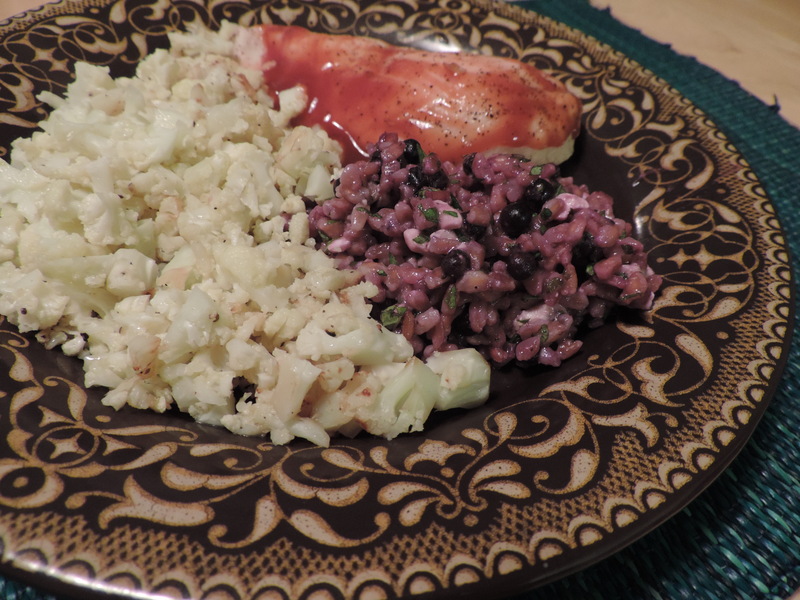 Serve with vegetables (cauliflower “rice” below) and fish or chicken (BBQ chicken was especially yummy). 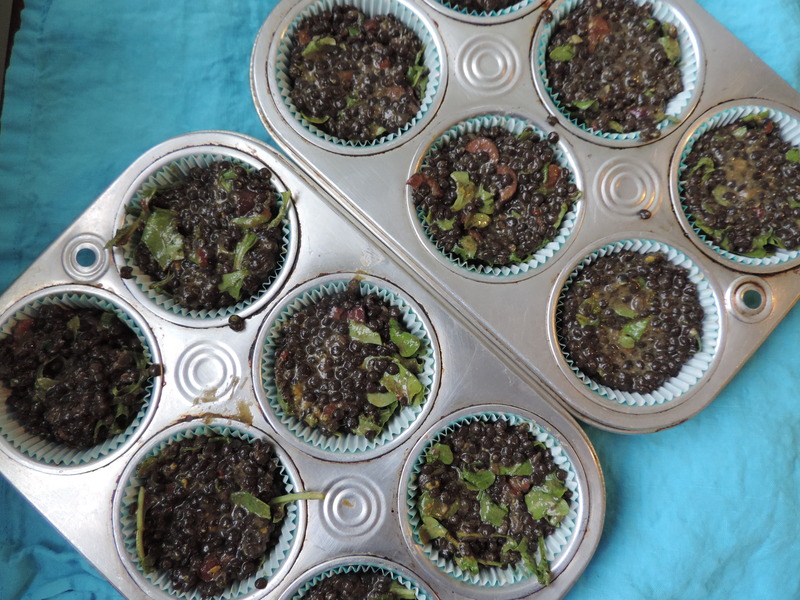 More delicious wild blueberry recipes — follow the link below! The purple color is not only pretty — it’s what makes purple asparagus a nutritional powerhouse. Anthocyanin, the flavanoid responsible for purple, red and blue colors in fruits and vegetables, is considered an antioxidant, able to remove free radicals (which can cause negative health effects, from inflammation to cancer). Various research has shown that anthocyanins also have antimicrobial properties and can decrease inflammation, improve blood pressure, improve eyesight and suppress the spread of cancer cells*. 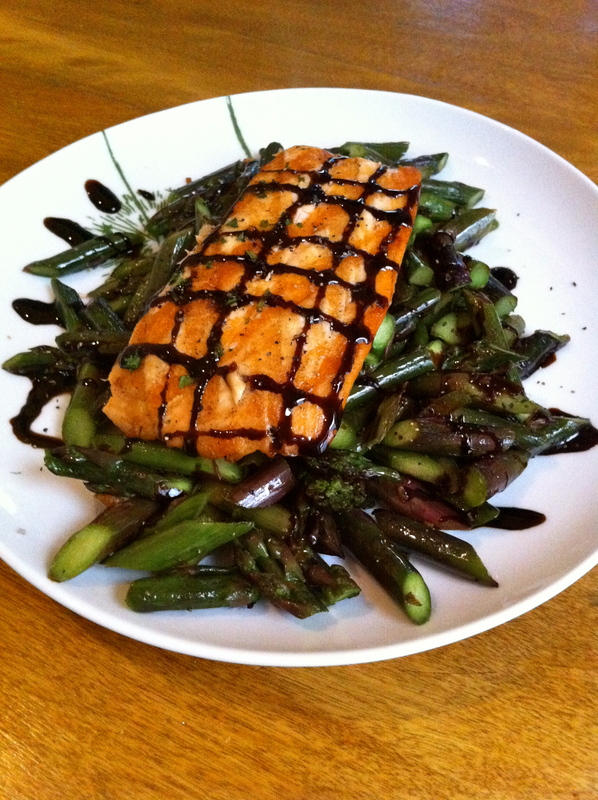 The most important point to note with purple asparagus, however, is that it is delicious. It tastes less bitter than green asparagus and just looks gorgeous as part of a meal. Dietitians and other health professionals will tell you to “eat the rainbow” not only because it will provide a variety of nutrients, but also because we eat with our eyes, and a colorful plate is much more appealing that a monochromatic one. With leftover salmon and purple asparagus on hand, I cooked up a delicious little meal. After cutting the asparagus on the bias, I sauteed it in coconut oil and minced garlic. This formed the bed underneath my salmon. I then drizzled with Trader Joe’s Balsamic Glaze (amazing stuff, by the way). A nice, light, low-carb lunch! *Source: J Biomed Biotechnol. 2004 December 1; 2004(5): 239–240. 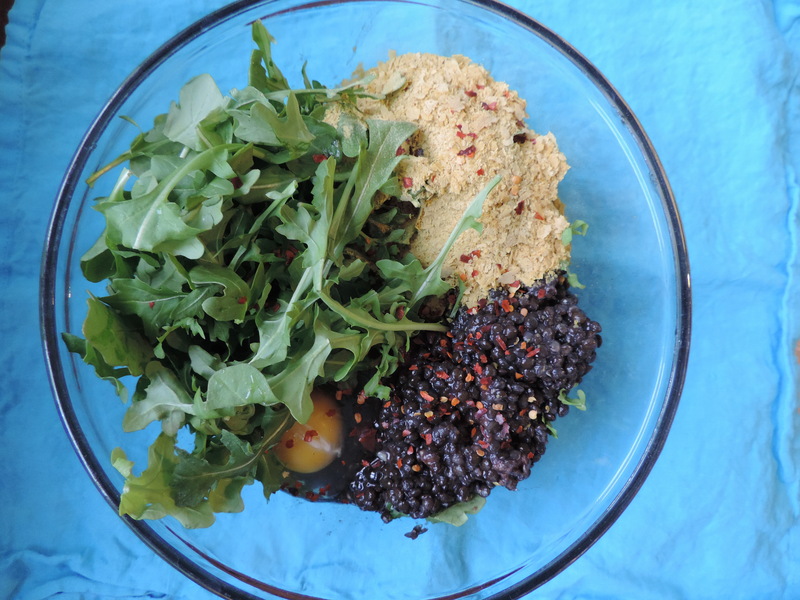 Quinoa is often praised by dietitians and other health professionals as a super-food. 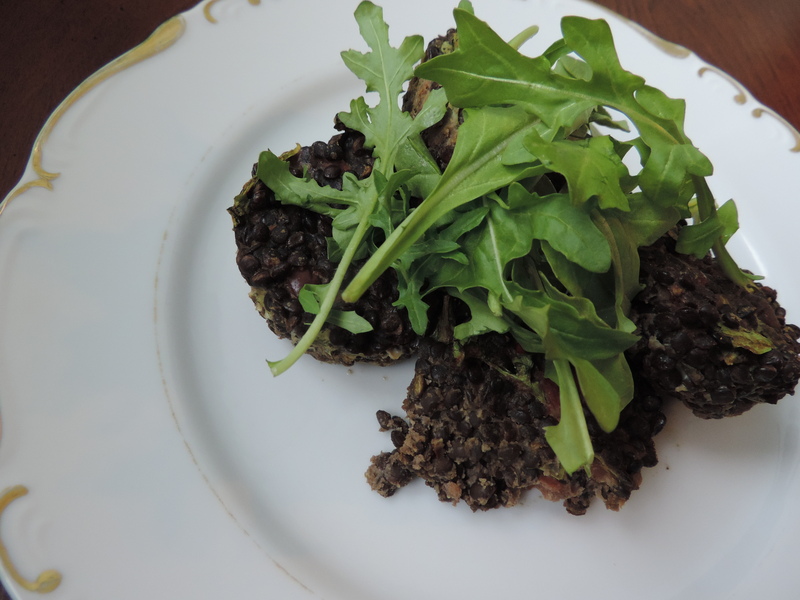 While I find the term “super-food” a little gimmicky, it is mostly true in the case of quinoa. A grain, quinoa (pronounced KENN-wah) is a good source of both fiber (with more than 5 grams/cup) AND protein (more than 8 grams/cup). While we know that whole grains, like quinoa, generally contain fiber, we don’t always get that one-two punch of fiber and protein. The best part? Quinoa’s amino acid profile is considered complete, meaning it doesn’t lack an amino acid like many other grain products do. Amino acids are the building blocks of proteins for our body. Our body can make ten of the 20 amino acids we need to make proteins in our bodies, but the other ten — considered essential amino acids — must be supplied by the foods we eat. Most plant sources of protein don’t provide all of the essential amino acids, so it’s even more impressive that quinoa does. I find that most people view quinoa as a savory food, often mixed with veggies and beans (and meat/poultry too) to create a quinoa salad. Think about it, though, quinoa is really just a bland-tasting grain when you get down to it. Thus, you can use it in sweeter preparations as well. Alas, Breakfast Quinoa! It’s a terrific option for when you have leftover quinoa from the night before (assuming you didn’t use broth or savory herbs to make it). 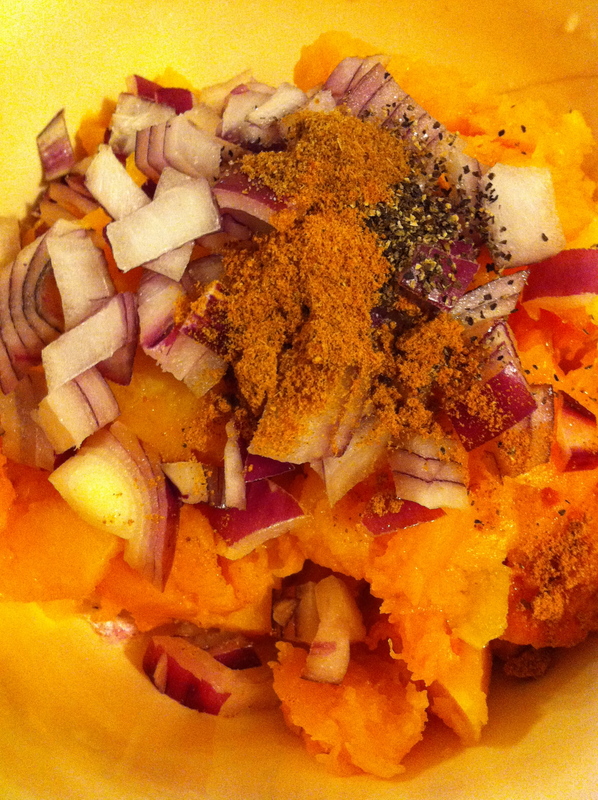 Just mix with whatever fruit and nuts you have on hand, plus some cinnamon or other sweeter spices. It’s more filling than oatmeal, because it contains more protein and fiber (the satiety dynamic duo, if you will). 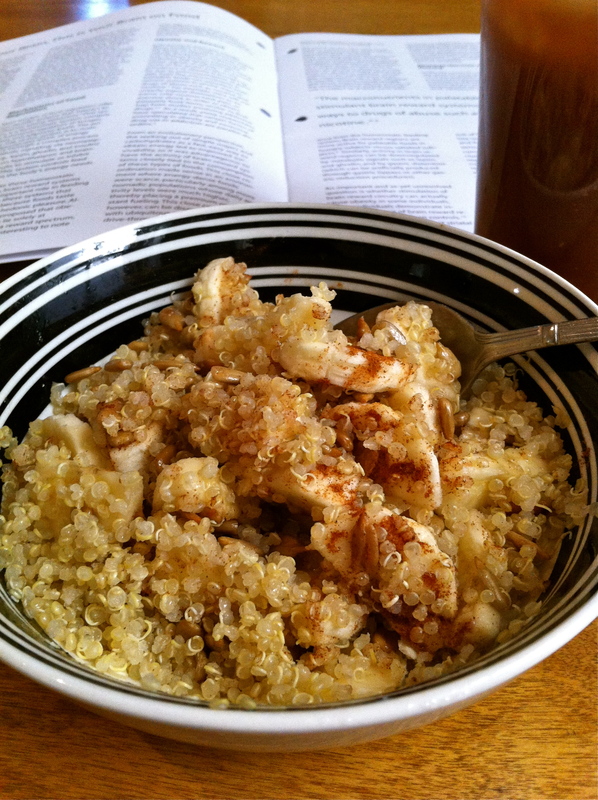 Check out my delicious Banana Coconut Quinoa below! Cook quinoa according to package directions or heat up leftover quinoa. Stir in coconut oil when hot, then top with sliced banana, sunflower seeds and cinnamon. 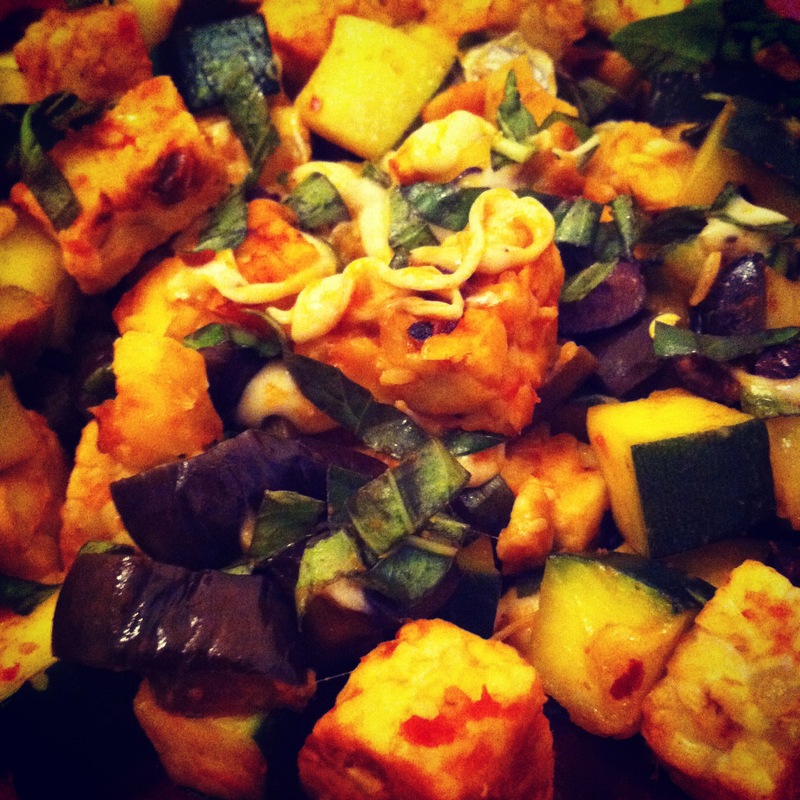 Bored of eggplant? Though eggplant is pretty well known (not really a “wtf” farmers market find), with its blandish taste, you may be getting tired of this vegetable. Besides the old stand-by, Eggplant Parmesan, what else can you do with eggplant? I set out to explore this question after picking up some eggplant from the Green City Market. I prefer a smaller eggplant, so I went with some Turkish eggplant (pictured above), along with Chinese eggplant, which is thinner than standard eggplant. 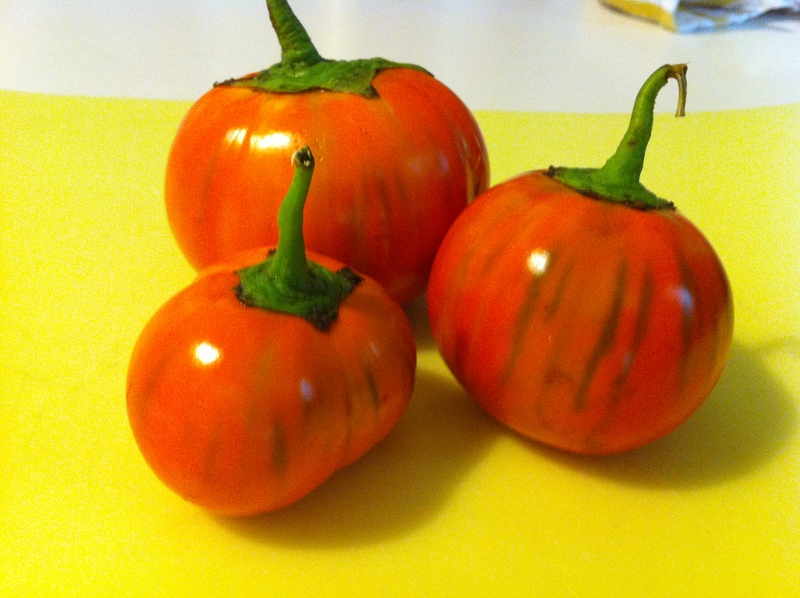 The Turkish eggplants look like mini pumpkins, right? Eggplants are often used as a meat replacement, though they are not high in protein. They are, however, high in fiber. For about a cup of eggplant, you’ll get 2 grams of fiber for only 20 calories. So, for 2 cups (enough to keep you satisfyingly full), it’ll only cost you 40 calories (plus the added bonus of 4 grams of fiber). Eggplants also contain potassium, which helps counteract salt consumption and aids in muscle function. 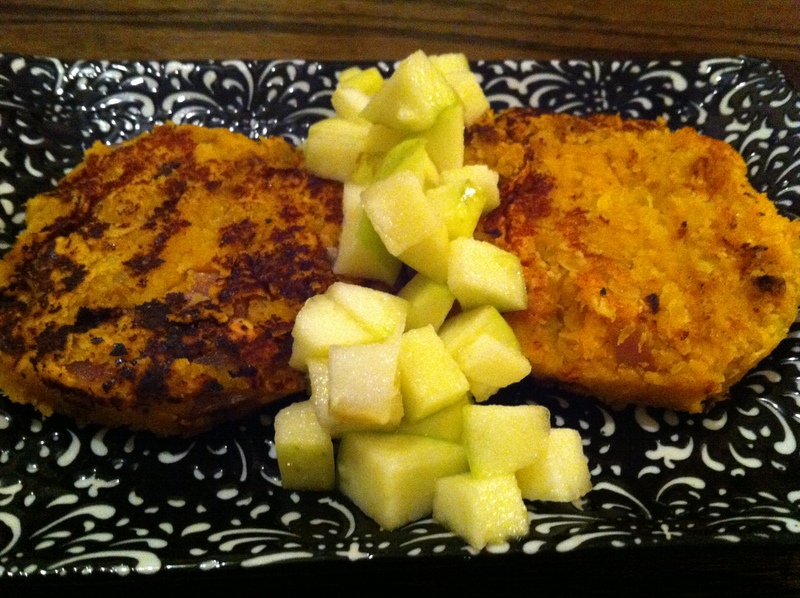 Keep in mind that fiber generally means filling, making eggplant an excellent addition to meals. I wanted to try using mine in a couple different ways. Let me say first that eggplant is delicious when roasted in the oven, but with the extremely hot weather in Chicago, I’ve been trying not to turn the oven on. 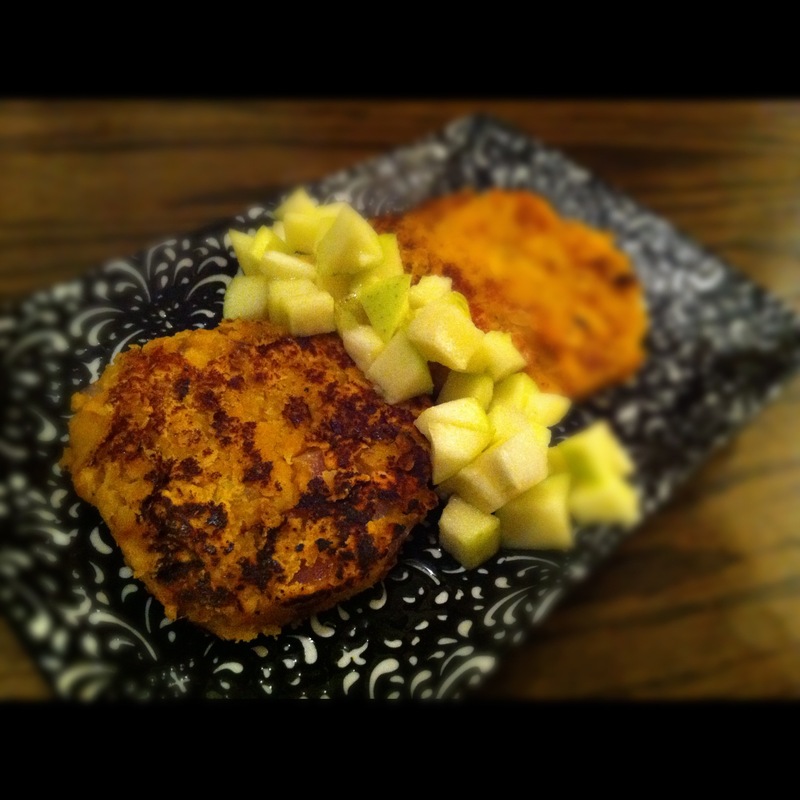 So, the following two recipes were done on a stove top – sans oven. Sprinkle eggplant with salt (this will draw out some of the water from the eggplant, making it easier/better for sauteeing). Heat garlic in olive oil for 1-2 minutes, then add eggplant and saute for about 5 minutes. Add tempeh and saute another 5 minutes. Sprinkle with mozzarella cheese and basil. Easy, no? 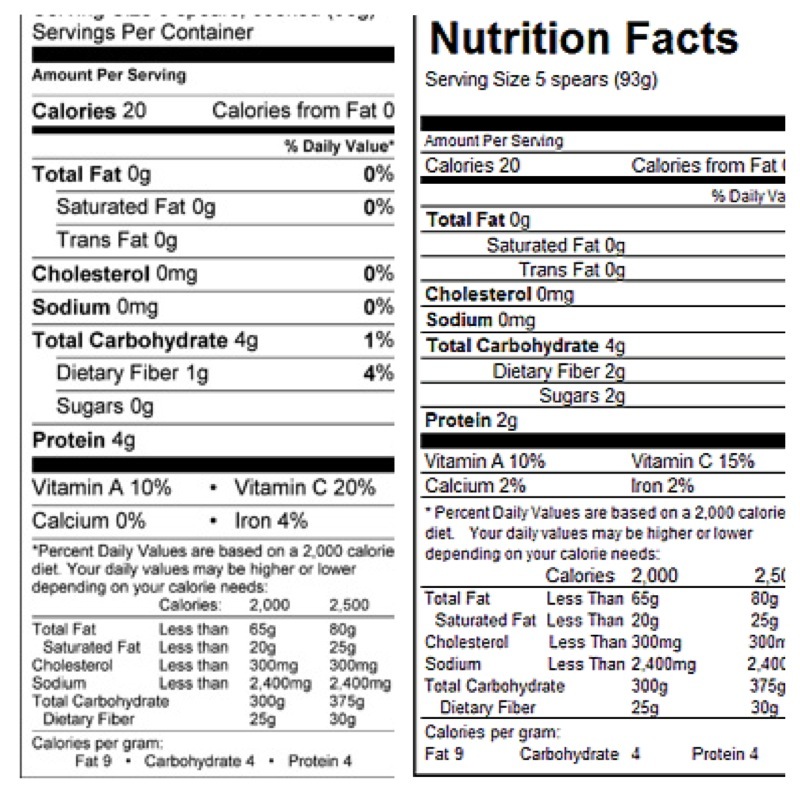 The above recipe is for a single serving. You can double, triple, etc. depending on how many people you’re feeding. 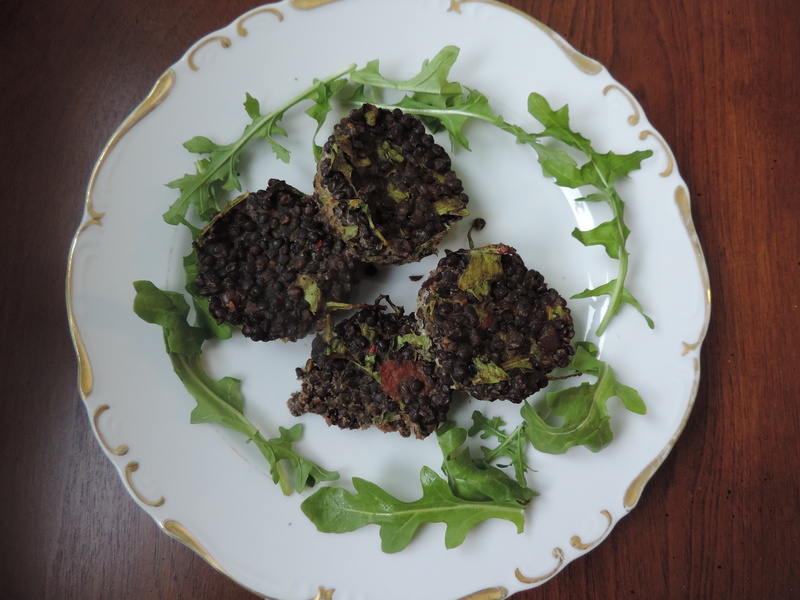 Okay, so this one is not so much a recipe as much as a method for cooking the eggplant. 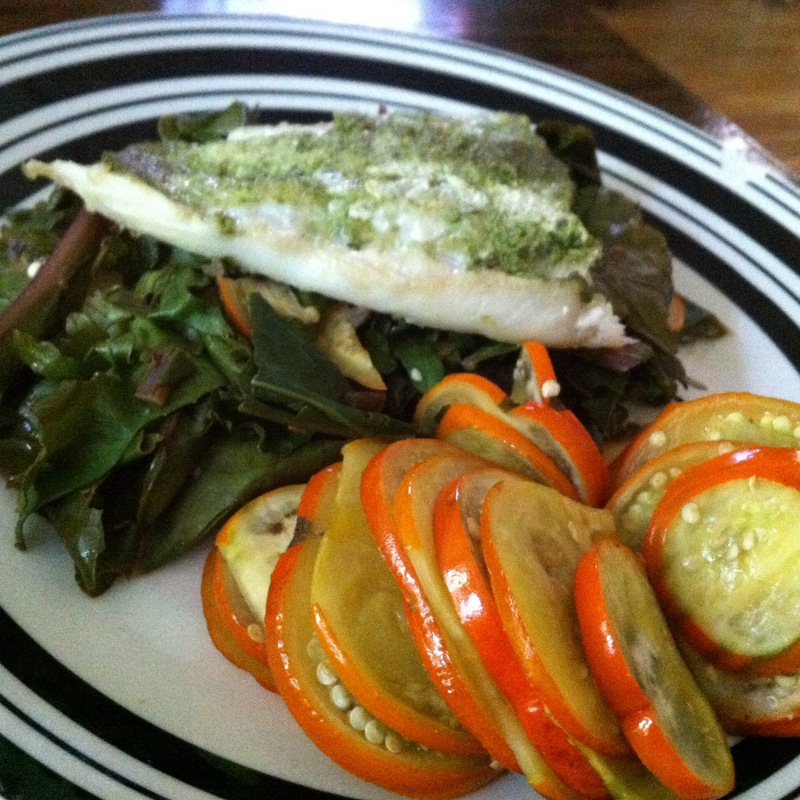 Eggplant chips, served with carrot top pesto smeared whitefish (over purple kale). 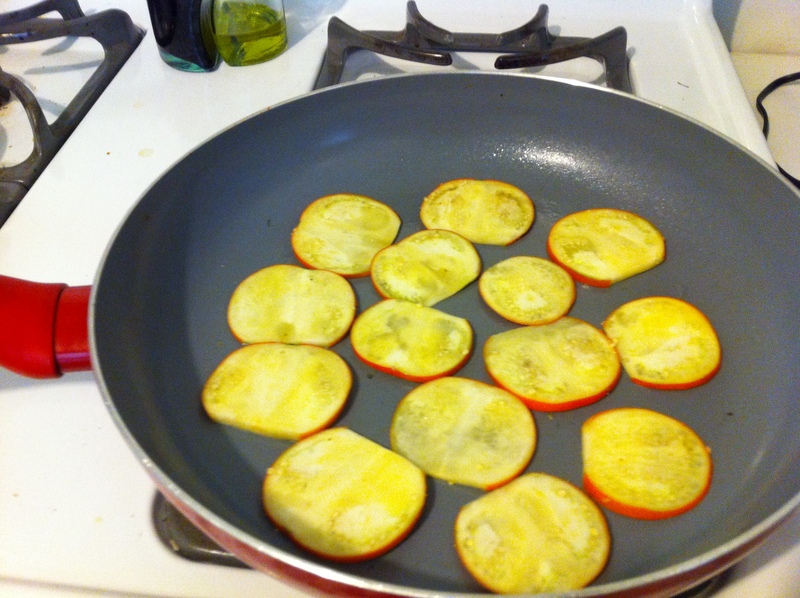 Directions:Cut eggplant into 1/4″ slices and sprinkle with salt to draw out moisture. Cook in a lightly oiled (or use cooking spray) pan for about 3-4 minutes per side (depending on how crispy you like the slices).